“Class, after you finish making an occupied bed, put the side-rails up, put the bed in the low position, be sure the patient is comfortable and all desired items are within reach including the call bell. Answer call lights quickly so that patients learn to trust you and do not feel the need to get up without help. Tell your patient when you will next check him and be prompt, ” instructed Professor Z. during our Nursing Fundamentals Skills Lab. 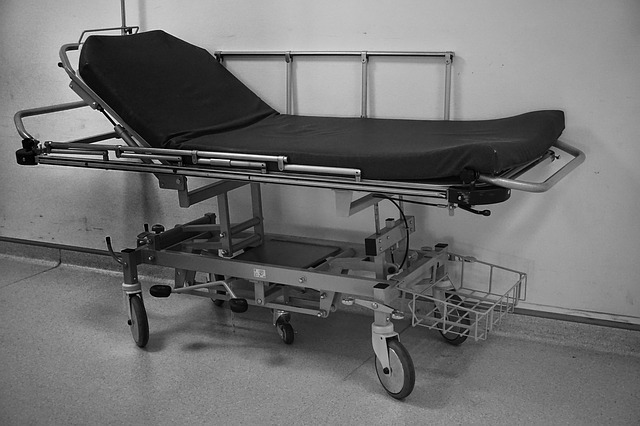 February, 2008 – Emergency Room Patient – 2 a.m. I lay on the stretcher with my head throbbing from the gash where I fainted at home alone the hour previously. I had a high fever and was heading for the kitchen when I lost consciousness. I woke up on my dining room floor in total darkness confused as to where I was and how I got there. God brought to my remembrance that my cell phone was in my pocket, so I called 911 because I was so weak I couldn’t even sit up. The paramedics came through the snowstorm to my deck door which was locked. I managed to scoot over to the door and reach up and undo the lock. They gently applied a dressing to my bleeding head, loaded me on the stretcher and carried me out into the bitter cold and into the ambulance. I begged them not to turn on the siren because my head was throbbing. They complied because there was no traffic at 2 a.m., and they couldn’t go very fast in the snowstorm. They placed me on a stretcher in a private room in the emergency room. When we arrived at the local hospital, they wheeled me into a private room in the emergency room (ER). The ER nurse started an IV in my arm and started pouring the fluids into me because my blood pressure was so low. They did a nasal swab for flu which came back positive. The masked doctor walked in, introduced himself, and said he would put staples in to close my scalp wound. I felt the prick of the lidocaine needle followed by stinging, and then my scalp became numb. I heard the “clunk, clunk, clunk…” about ten times as he put the staples in my head. He said I would have a CT scan of my brain to see if I had any internal bleeding. The doctor and nurse walked out of the room and tightly closed the door since I was now in isolation to contain the flu virus. After nearly a liter of IV fluids, I knew I would need the bedpan soon. I fumbled for my call light among the blankets. Where was it? I slowly turned my head and saw it lying on the shelf out of reach. I weakly called as loud as I could, “Nurse, Nurse!” I knew no one could hear me call through the tightly closed door. I prayed, “Dear Lord, Please send me someone soon to help me so I won’t have to wet the bed. You know how miserable I feel.” The minutes ticked by as my bladder became more uncomfortable. 5 minutes, 10 minutes, 15 minutes, 20 minutes…..I couldn’t hold my urine any longer and wet the stretcher as my tears wet my pillow. The door opened about 10 minutes later and I told the nurse what had happened. She looked at me with embarrassment at having forgotten to give me my call light and apologized. She said they had a patient who had a cardiac arrest and I told her I understood. The tech came in and together they cleaned me up, changed the sheets and my gown as I painfully and slowly rolled side to side on the narrow stretcher. They sent me for the CT scan which showed I did not have any internal bleeding and then admitted me for the next four days. They started me on Tamiflu medicine immediately which shortened the course of the flu from two weeks to a few days. They diagnosed me with a concussion and discharged me home to recover. I have never forgotten how helpless, isolated, deserted and forgotten I felt during those long minutes on the stretcher when I didn’t have my call light. While I waited for my brain to heal from the concussion, it felt like my headache, dizziness, weakness, and inability to read would never go away. My nurse practitioner said no one could tell me if or when my brain would heal. I wondered if I would ever be able to drive again? I asked God to heal me or show me how to live alone in my present weakened condition. I thanked Him when He brought to mind all the verses I had memorized and that I could listen to Bible messages and comforting music. I called a friend who was a pain specialist physician and asked him if he had any recommendations? He suggested my nurse practitioner order gabapentin which is used successfully for headaches from concussions. She agreed and started me at a very small dose of 100 mg. at night since it makes one even dizzier initially. On the fourth night, she increased it to 200 mg. and on the seventh night to 300 mg. My headaches and dizziness finally went away, and I slowly began to feel like my old self. After about a month, I was able to slowly taper off the medication. How I thanked God that after three months I was finally able to return to the nursing home where I worked as a Nurse Practitioner! I became acutely aware of triple checking to make sure all my patients had their call light before I left their room. I also thank God that even though people may forget me, He never forgets or leaves me or any of His dear children! I was richly blessed in reading a selection from Miles J. Stanford’s None But the Hungry Heart. Previous postIs Anything too Hard for You, Lord? What a well-written, beautiful piece! It’s definitely eye-opening when we become the patient. Even though my times as a patient have been very difficult for me, I think they have made me a more compassionate nurse and pressed me closer to the Lord in simple trust in my utter weakness.